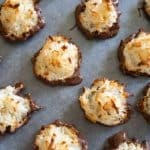 These macaroons are super easy, only need a few ingredients and come out just perfect-crisp on the outside and chewy inside. They are perfect on their own but I like to take mine up just a notch by dipping them in chocolate on the bottom half. It seriously takes them over the top! 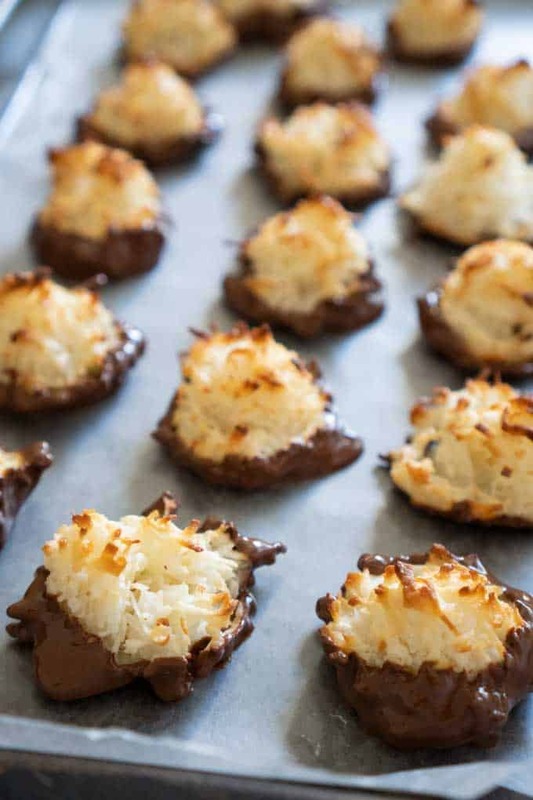 A few tips before I share this easy macaroon recipe. These are quite easy BUT they do require attention to detail. Be sure to beat the egg whites until they form stiff peaks. Line cookie sheets with parchment paper or a silicone baking mat. 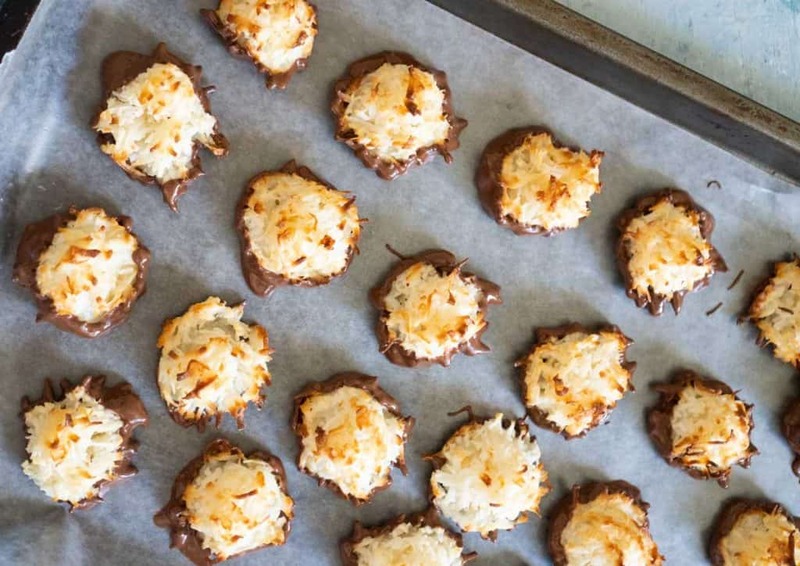 Use a spoon or cookie scoop to lay the cookies out on the baking sheet. I use a spoon to also “tidy” the cookie up before popping in the oven also. This helps make sure the stray coconut bits don’t burn. When baking, check them often!! I set my timer for every six minutes to check them in the oven and rotate the pan if one side or the top and bottom seems to be baking unevenly. Mine usually take between 12 and 15 minutes, as the oven opens and closes the temperature will go down and they may take longer to bake. You want to take them out just as they turn golden brown on the top and edges. 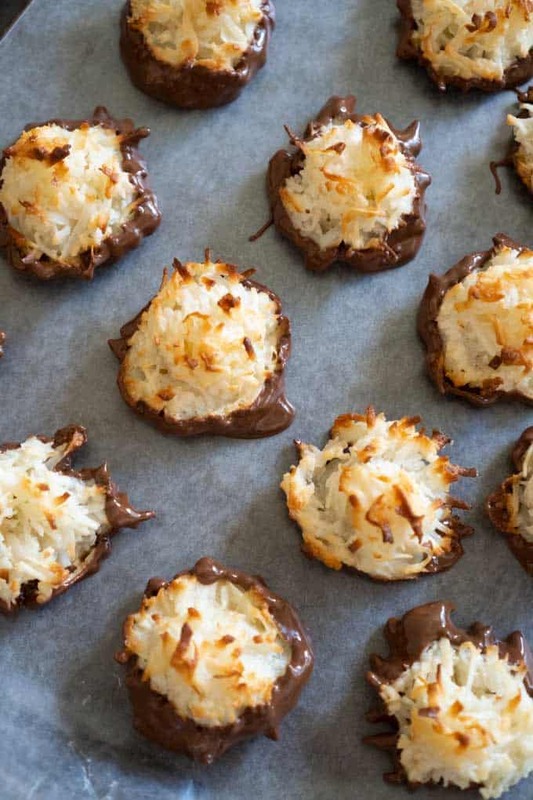 This easy macaroon recipe is even better dipped in delicious chocolate! Only six ingredients and ready in an hour! Preheat oven to 325 degrees F. Line a baking sheet with parchment paper or a silicone baking mat. In a stand mixer, combine egg whites and salt and beat on meadium speed until stiff peaks form. Meanwhile in a large bowl combine coconut, vanilla extract, and sweetened condensed milk until thoroughly blended. Fold in egg whites and mix. Use two spoons or a cookie scoop to form balls of dough mixture and place one inch apart on prepared baking sheets. Bake for 12-15 minutes, checking every 6 minutes or so and turning as necessary to prevent uneven browning. Remove from oven when golden brown on the top and sides. Allow to cool on baking sheet 5 minutes before removing to cooling rack. Once cookies are completely cool you may dip in chocolate if desired. Line a baking sheet with wax paper. Melt dipping chocolate according to package instructions and dip the bottom of cookies in the chocolate and place on prepared baking sheet. Chill to set chocolate. Use a spoon to also “tidy” the cookie up before popping in the oven also. This helps make sure the stray coconut bits don’t burn. To freeze, layer with parchment paper in airtight container and store in freezer up to three months. What do you think? 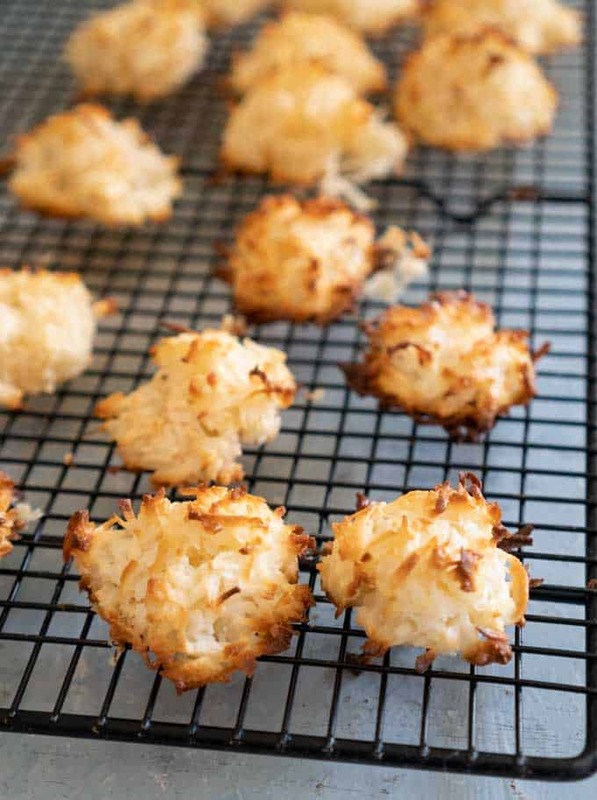 Will you be adding this easy macaroon recipe to your holiday baking list this year? This is a quick and easy recipe! Very much like my grammies recipe! Yummmmm! So easy and delicious. Didn’t have any trouble with melting down. They held their shape well.